At the age of 21, Lorenzo Dow Stephens heard the call of adventure and fortune and on March 28, 1849, joined an Illinois party bound for California goldfields. The outfits generally consisted of three to four yoke of oxen, good strong wagons well loaded with provisions, bedding and clothing. In fact, we found later that we were too heavily loaded. Let me say here that the hardest pull we had was the leave-taking. We were leaving behind home, all that was near and dear, all the friends among whom our youthful days were spent. In fact, I never realized how hard a pull it was until I came to bid goodbye and started to drive away. I never felt so much like backing out of any undertaking as I did then, but, I had too much pride to stand laughter, so the reins were gathered up and the expedition moved. That spring happened to be a very wet one, and the roads were almost impassable. The streams were swollen and overflowing their banks, bridges were washed away, and consequently, much time had to be spent repairing and building new ones. 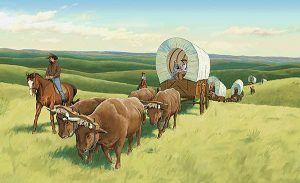 On many of the larger streams we constructed rafts of logs and rafted the wagons over, and the cattle were made to swim. Through Iowa, we found many prairie sloughs, and they seemed bottomless. Here, we had to cut sod and lay several thicknesses before we could pass over. Having started early in the season we had to buy feed for the stock until we reached the Missouri River, as the grass wasn’t high enough to keep the stock in traveling condition. Iowa, at this time, was very sparsely settled. Farmhouses were 20 miles and more apart, and we found, here and there, villages of cheap unpainted houses. We found game in plenty, consisting chiefly of deer, wild turkeys, and prairie chickens. When we reached the Missouri River at Council Bluff, Iowa we traveled down the river to Traders’ Point, a distance of 10-12 twelve miles. Here, we remained for a week, waiting for the grass to get a good start, arranging for a larger expedition. This point was the end of the settlements, and further on, lay the Indian country. We realized a larger body would be safer, but, we found that it took more time and we could make little headway with so large an expedition. So we divided into companies, and in this way, traveled faster. We had quite an experience crossing the Missouri River. The ferry was a small scow and could carry but one empty wagon at a time. The scow was propelled by two oars, two men at an oar and the current was very swift. 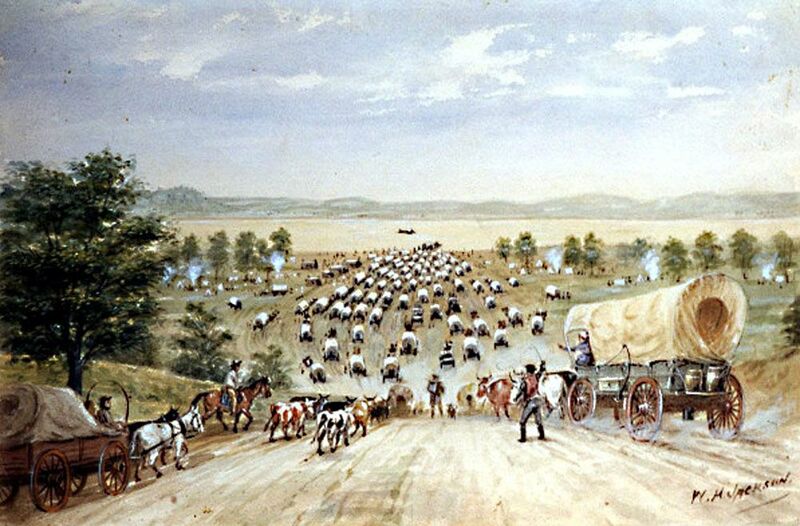 Imagine the time it took to transport 50 wagons and the loads; we had difficulty getting the cattle to swim at first. We didn’t realize that the sun shining on the water made much difference, so the first time the cattle swam round and round for two hours, and we were compelled to let them land again where they started. But, the next morning before sunrise we started a small boat with a couple of men having a steer in tow, all the rest of the cattle followed without any trouble and made the opposite shore safely. Our first experience with the Indians came with our first camp across the river. Our campfires were going nicely, supper was started, when we heard gunshots, volley after volley. In a few minutes from over the ridge came 200-300 Pawnee Indians, riding at full run straight for our camp. It was a few minutes work for us to get our rifles in readiness, but, the Indians put up a white flag, and they were allowed to enter camp. 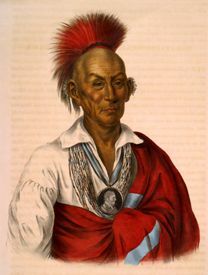 It seemed that a party of the Sioux tribe had given them battle, the two being at war, and the Pawnee had rushed to our camp expecting protection, but, we ordered them off, telling them we wished no trouble with the Sioux as we had to travel their country, and wanted no enemies. We took the precaution to organize our body with regular military style with Colonels and Captains. For a while, we were very vigilant. Our picket guards were stationed 300 yards from camp, and had to lie down to see any approaching object, but, firing was strictly prohibited unless you thought an enemy approached. We did not want any false alarms, but, like many others, we grew careless of danger. Many of us went two or three miles from camp, often being away all day hunting and looking over the country. I remember that two of us traveled a long distance on the bank of the river, when, without any warning, an Indian appeared before us. At the same time, geese were flying overhead and the Indian said, “Shoot, shoot.” My companion raised his gun, and I made a quick dash to lower it, and said: “we had better not waste our shot, for I don’t like the looks of things.” We had moved but a few steps when arrows rained down all about us, but, not an Indian in sight, except the one we had spoken with. After a short distance more, beyond the range of arrows, we turned and saw over a dozen Indians raising up out of the grass. I was carrying a very fine rifle with 27 pieces of silver mounting, and I think this was what they wished. We must have been a little out of range for them to shoot directly at us, but, a falling arrow would answer their purpose just as well. It is needless to relate that all possible haste was made for our train, ten miles away. Of course, our story was rather doubted by the other boys, and we were joshed about the scalps we didn’t take. Somewhere in the western part of Iowa, we passed the grave of the Indian Chief, Black Hawk, of Black Hawk War fame. It was near the bank of a small stream, the name of which I’ve forgotten. We had a little mishap here in rafting the stream. Our raft was going along nicely when, in some way, the wagon went to the bottom of the river, out of sight. The stream was sluggish, and we didn’t have much difficulty in fishing the wagon out. Fortunately, the load had been transferred to another wagon, but, we did have one load damaged on another occasion when the wagon turned over crossing a stream. This was quite serious, as three barrels of hard bread was entirely ruined. 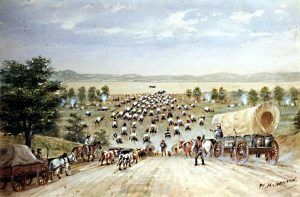 About 20 miles from the Missouri River we came to the winter quarters of the Mormon excursion of 1846 and 1847. There was no one there, but, we secured a Mormon Guide Book, and it proved of great assistance. They had measured the roads, and distances from camp to camp were recorded. The entire distance from the winter quarters to Salt Lake City was 1,031 miles, and but, two houses in the entire distance. These were at Fort Laramie and Fort Bridger, Wyoming. At the first fort there were 20 soldiers and at the latter only James Bridger and some Indians. I just mention a little incident here. Several of us boys had gone ahead of the train and were enjoying ourselves asking Bridger questions. He was an old mountaineer and could give us good advice. While we were talking, Indians began to pour in from different quarters, very much excited and saying Indians were coming. Everybody hustled around, the Indians flocked in, the doors were barred, rifles made ready for the scrap when a pack train came in sight. It was an emigrant train from Arkansas, and being the first one from that direction, from a distance, it was natural to infer they were Indians.